These cookies are as cute as they are delicious. I’m not great at decorating Christmas cookies. Mine usually end up looking like a child was involved and not in a charming way! Ha! So when I saw a recipe for these cookies, I wanted to try them–and to my surprise, they were as delicious as they were cute! It takes a little extra effort but the toasted almonds and chia spice with the chocolate, make for a really lovely and sophisticated cookie. I used both dark chocolate and white chocolate and liked the dark chocolate better, but you decide which you would prefer! Add these to your Christmas cookie plate and enjoy every last little crumble! In a large mixing bowl beat the butter, sugar, and salt with an electric mixer on medium-low speed until smooth, about 1 minute. Reduce the speed to low; beat in vanilla. Mix flour and chia spice together. Turn off the mixer, add the flour mixture all at once. With the mixer on low, beat just until the flour disappears into dough (dough may appear crumbly). Using your hands, work dough into a ball. Wrap and chill dough 30 to 60 minutes or until easy to handle. Preheat oven to 375 degrees F. On a lightly floured surface roll dough to 1/4 inch thick. Use a 2-inch teardrop-shape or oval cookie cutter to cut the dough (I used an easter egg shape and just made the smaller end a little pointier with my hands). Arrange cutouts 2 inches apart on an ungreased cookie sheet. Insert almonds at an angle on cutouts to resemble a pine cone, leaving about 1/2 inch at the bottoms. If you feel your dough has gotten too soft, place back in the refrigerator to chill again. Bake 8 to 10 minutes or until edges start to brown. Cool on cookie sheet 1 minute. Remove; cool on wire racks. Place chocolate and shortening in a small bowl. Microwave 1 minute or until melted and smooth, stirring once. 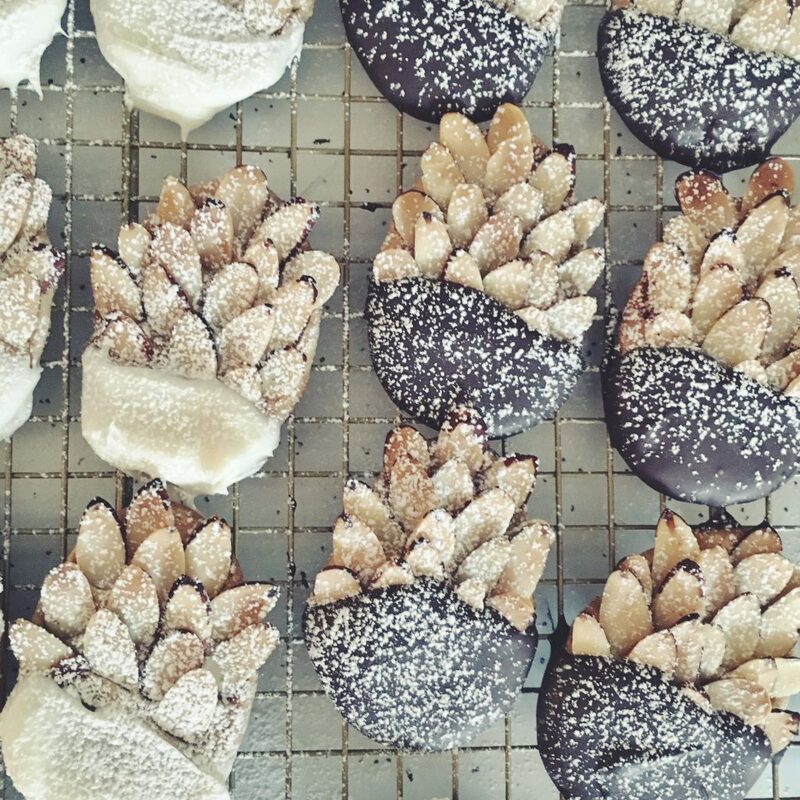 Dip the bottom of each pine cone into melted chocolate mixture. Let stand or chill until set. If desired, lightly sprinkle with powdered sugar.